Just when you thought it was safe to vandalize gravestones, two emo kids come along and discover that getting in trouble by their parents would have been a more prefered consequence for disrespecting the dead as their exploits open up a portal to a hostile world. Fortunately for them (though I assume they died as a result) and the rest of humanity, a group of random heroes shows up right when the world needs them most. 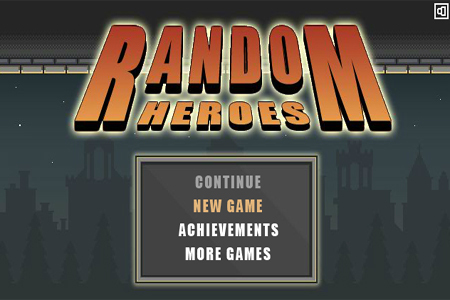 Random Heroes is a simple action platformer that has you collecting coins, shooting monsters and navigating treacherous obstacles all in the name of being randomly heroic. Being able to upgrade you character adds a bit of extra flavor to a by the books game with solid controls and a pretty awesome retro look. 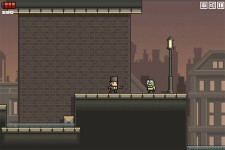 Should you need to kill a bit of time, this is the perfect game as the unfortunate citizens featured in the game could really use a hand. Wizardtrain187 - "a clueless, nonsensical, straw-clutching loser who is desperate for hits on his no-name blog."